This is a fantastic outerwear that looks more of a costume than a jacket. It is a replica of the outfit worn by actor James McAvoy in the movie X Men First class. 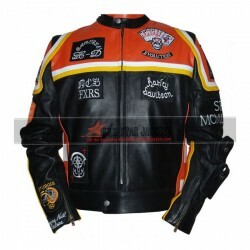 This leather jacket with a stand collar has a front zip for the closure and it looks bright and colorful because it has been made using stripes of three colors yellow, blue, and black. The feature of black belts running from shoulders till the waist where metallic buckles have been used helps in making this jacket visually very appealing. This is my favorite outerwear that never goes unnoticed by all the girls at a social gathering. Despite being so stylish, it is an extreme ely soft and comfortable jacket.